While a warm, bubbly bath is perceived as an indulgent form of relaxation and tranquility for us humans, our feline friends may definitely not share the same type of contentment. Is’t a fact that a cat afraid of water is not particularly uncommon, however we must admit that it is also a fact that there is nothing prohibiting us from teaching our cats to tolerate baths better. If your cat is particularly fearful of water, next time when bath time comes around, you may expect a teeth and claw struggle worthy of considering to call it quits. Unless you are fortunate enough to be blessed with a Turkish Van (a cat breed famous for their tolerance of water) you may find yourself wishing your cat would never get dirty. However, with patience and a little bit of “cat psychology’ you may ultimately train your cat to -let’s not say “enjoy”- but at least tolerate better getting soaked from head to toe.. Your best bet in teaching your cat to accept a bath without struggle, is getting it used to water at an early age. When cats are kittens they are much easier to train. The secret is to start early and keep the kitten exposed to regular baths to keep up the training. It is very important to keep kitty from getting traumatized and turning bath time into a pleasant event. In other words do not use a spray bottle to punish your cat. 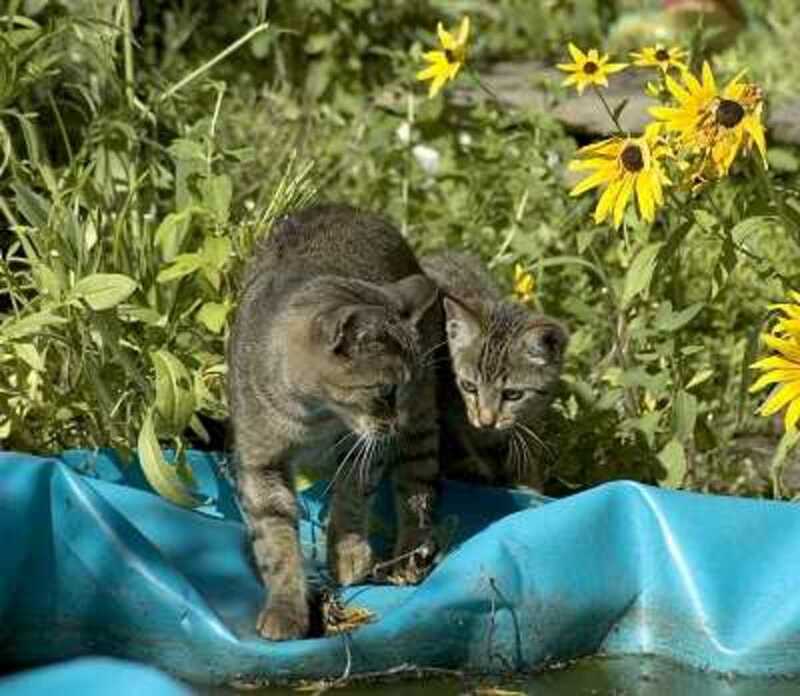 Many owners use water to deter cats from unwanted behaviors. What this does is it causes cats to associate water with something unpleasant. All it takes is a couple of sprays and the cat will turn a natural aversion to water into a phobia. Some cats are naturally attracted to water. It is not unusual to find cats playing with the water in the sink or their water bowl. Do not discourage such behavior. A water fountain may be a great gift to such cats. As the cat plays with the water he/she will eventually get wet and the cat will learn to accept and ignore such instance. Cats can read your emotions, they know that you are tensing up at the simple thought of giving him/her a bath. They also can read from your physical cues that when you grab that towel and that sponge it means that he/she is next on the list and very likely will hide under the bed turning bath time into a hide and seek game. If you own a long haired cat you may want to comb out your cat thouroughly. All dogs and cats should have the ears plugged with cottonballs to avoid water from penetrating in the ear causing a great place for bacteria to establish. A drop of mineral oil in each eye may also prevent soap burn. Tearless shampoo works wonders too. Your faucet running with water may feel like the roar of the Niagara falls to a small cat. Turn the faucet off. Try not to splash or make loud noises either. A cup full of water splashed on the cat’s coat may scare the cat off. Rather, wet a sponge and pass it around until you can work the shampoo in a lather. Also make sure the water is at an ideal temperature. Your shower is out of question and so is the bath tub and sink. Use instead a small water basin and place it in a place your cat normally plays or eats so he/she feels in a familiar reassuring surrounding. Do not over fill the basin as cats may be traumatized by being submerged too much in high water. You do not want the cat’s head soaked with the shower head or bottle of water. Cats are particularly sensitive to having their heads wet in such a manner. Also, having water in their eyes and ears may scare a cat further making bath time a bad experience. Not to mention, the risks of having wet ears and soap in the eyes if the above tips were not applied. If you must really clean the cat’s face simply use a wet towel and gently clean with just water. Pet your cat and praise lavishly as you bath him/her. Kittens may even purr from contentment. Make bath time a fun event that your cat may enjoy. Should your cat try to escape the basin, get the cat from the neck just as their mom does as kittens and place him/her back. By slightly pinching the skin on the neck most cats go into a relaxed state of mind. Some cats may be pretty stoic when bathed but will freak out when dried with a blow dryer. Skip the blow dryer which by the way has been associated with severe burns. Instead wrap kitty in a towel and cuddly with kitty. Some cat really enjoy this part as they are safely parted from the water and feel comfy. If you give a bath once a year, your cat may forget about all the good things associated with the previous baths. Take advantage of summer time to frequently cool down kitty with a nice cool sponge. Last but not least, show kitty that as an owner you take baths too! Leave the door slightly ajar when taking a bath and allow curious kitty to come in. Chances are high the cat will come in on its own. Allow the cat to stand up against the tub and look at the water. Cats are highly intelligent creatures and their inquisitive nature allows them to learn a lot about the world around them. While you may never find your cat inside your jacuzzi sipping on a cocktail, your cat at least, may show that it may be able to tolerate water. Do not have too many high expectations, but rather appreciate if your cat will stay for a few minutes still, without putting up a major struggle. Cats and water may never be be a winning combination, but being able to successfully give a bath is what really ultimately matters.